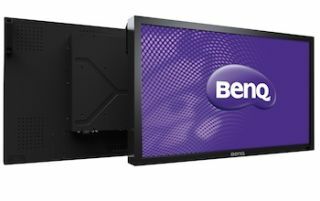 InfoComm 2012 will mark the debut of BenQ's new 42-inch, 55-inch, and 65-inch interactive flat panels (IFPs) with 1920x1080 full HD resolution. Combining the power of touch technology with multimedia connectivity, the T420, T650, and TL550 maximize the learning experience for students, according to the company, while enhancing meeting efficiency, training effectiveness, collaborative discussions, and team building exercises in corporate, government, and military applications. In addition, the IFPs bring high performance to interactive digital signage applications, video walls, eBoard information displays - such as menus and airport flight schedules - and more. The CCFL T420 and T650 offer dynamic contrast ratios of 4,000:1 and 9,000:1, while the LED TL550 offers a dynamic contrast ratio of 10,000:1. Optical Sensing Touch Technology: allows users to control their computer directly by touching the screen. Taking advantage of this functionality is as simple as connecting a computer to an IFP with a USB cable. Optical Dual Touch Technology: turns the displayed image or spreadsheet into a multitouch screen, when paired with Windows 7. Ambient Light Sensor: detects the amount of ambient light in its surroundings and automatically adjusts the display setting accordingly. Integrated Speaker: Makes every presentation more engaging by taking advantage of videos, music, and sound effects.